When it’s cold or just want to look cool then this Doctor Who beanie hat could be just what you need. This black Doctor Who winter hat is perfect for both men and women that are true fans of the Doctor and his adventures. 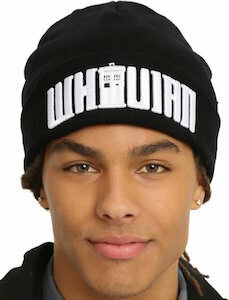 On the front of the black beanie it says in big white letters “WHOVIAN” only there is no O as it is replaced by the Tardis. This 100% acrylic hat is truly a winter hat for a geeky Doctor Who fan that knows that it does not matter what other people think of your amazing new beanie hat. True Doctor Who fans are also called Whovian’s and this navy blue t-shirt says that only they replaced the O with a picture of a Dalek. But you maybe a Whovian that does not like Dalek and that is why you should wear this t-shirt because you can warn the world about the bad Dalek out there. 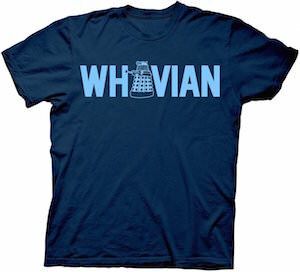 And you can get this Doctor Who t-shirt in sizes Small – 3XL and all of them have a Dalek in the Whovian. Of course you are gone love this t-shirt specially as not everyone is gone get what it means and that means that you and you group of Whovian friends are even more special. Doctor Who fans come check out this Doctor Who Dalek Whovian T-Shirt. This navy blue t-shirt is all about telling the world what you really are. Yes this t-shirt say in big letters “Whovian” and afar that they will all know that Doctor Who is your thing. OK many will still not know as they don’t even know what a Whovian is. Besides having the word Whovian in white letters there is also a green circle surrounding a sonic screwdriver and this could be the sonic screwdriver from doctor number 11 or even the 12th Doctor. So now you can have an amazing looking t-shirt and most people will not know that it is a Doctor Who t-shirt but many will know it’s made from 100% cotton. And besides being a cotton Doctor Who t-shirt it’s good to know that it comes in sizes Small – 3XL. Get ready to come out and tell the world what you are. 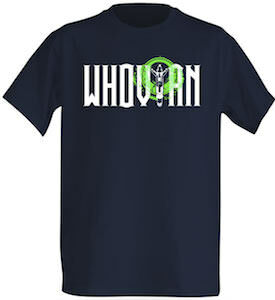 Come and start wearing this Doctor Who Whovian t-shirt. Fans of Doctor Who can now wear a rubber wristband to show that they are the real thing. 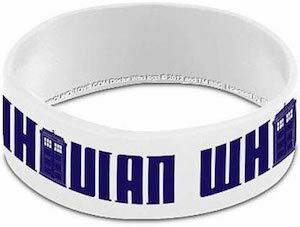 This wristband is white and on that in blue letters it says “Whovian” and the O of Whovian is a picture of the Tardis. And as white goes with anything, you can mix and match it with the rest of you outfit. A rubber bracelet like this is fun to wear and could be a great way to meet fellow Whovian’s as now they now you are one of them. This white Doctor Who bracelet is great for everyday wear and will be a hit at school and work so I would not wait any longer and just order a Doctor Who White Whovian Wristband. As a true Whovian you of course already have this Whovian Necklace but now there is a fun bracelet for the days that you don’t want to wear a necklace. Now you as die hard Doctor Who fan can have a fun bracelet around your wrist that tells you and everyone else how much you like the Doctor and his adventures. The Whovian bracelet is 8 inch long and has a blue cord with a metal sign that says “Whovian” it all looks fun together and matches with almost anything. So as a fan of the Doctor this bracelet will be admired by many so do not hesitate and order yours today. Come and get your Doctor Who Whovian Bracelet. Doctor Who fans deserve a special necklace that tells them and the world that they are fans of the Doctor. 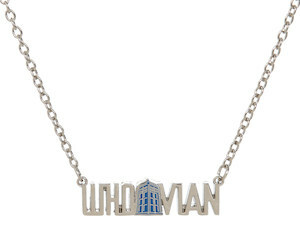 This Doctor Who necklace is perfect as it says “Whovian” and in the middle of the word it has a little blue Tardis making it perfect. 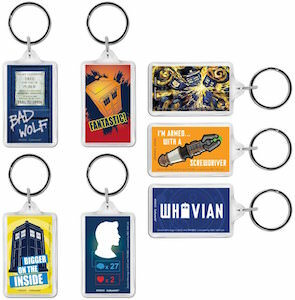 The Whovian necklace is made from metal and has a 19″ chain and the pendant is 1 3/4″ x 1/4″ . If you are looking for the perfect jewelry for a Doctor Who fan then you are in luck as this necklace is just perfect. You should have a closer look at this Doctor Who Whovian Necklace.